Work is progressing on the helix. 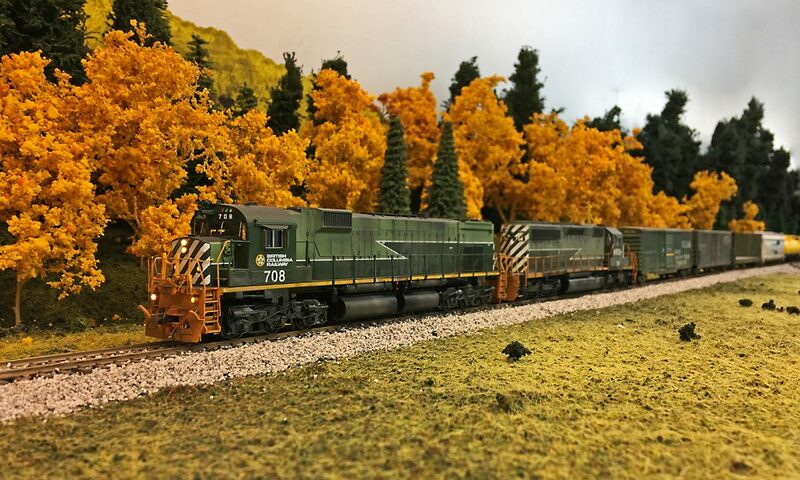 I got impatient, went to the hobby shop and cleaned them out of Peco Code 83 flextrack, which only amounted to 19 3 foot long pieces. In the past I had used Atlas Code 83, however Atlas has some serious problems with their Chinese factories and has been unable to provide the hooby market with enough track. I didn’t think much of the whole situation until I needed track. The unavailability of Code 83 track husrts many hobbyists. 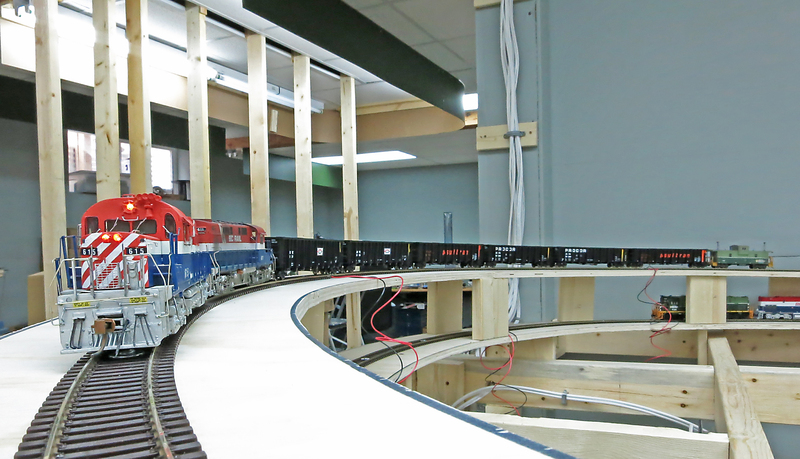 I had planned on using 100% Rapido Bendy track for the layout, but I didn’t want to sit around waiting for track. Mike at Rapido assures me the track will hit Canadian soil this week, so I should see some track in a couple weeks. I think I’ll start ordering a case of track a month until I’m finished with track work, just to make sure I have enough! Now, onto the test train. Pictured here is a 6 car Pinesul Local. This local will run out of Chetwuynd on the lower level, up the helix to Pinesul, the site of a sulphur loadout. The local will swap empties for loads, then return to Chetwynd. The local may also make a run farther :South” to Tacheeda to lift any bad order/off spot/ MOW cars as needed. Since I had the cars on my work bench, I decided to test them up the 2 loops of the helix that I’ve built so far. Test was successful, and the 2 RS-18’s ran well together considering the 615 is an Atlas model with a Tsunami decoder and the 611 is an Overland import with no decoder in it (yest). As you can see I’ve got some weathering to do on the 615 and the sulphur cars…….